Born in Vänersborg, Sweden in 1921, Bertil Thorén demonstrated a childhood interest in science and technology. He studied electrical engineering at the Technical University in Stockholm, and in 1944, earned his master's degree. 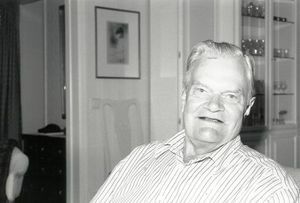 As military service in Sweden was compulsory, he spent a year in the military before seeking employment, first at ASEA, and then obtaining steady employment at the Ludvika High Voltage and Short Circuit Laboratory as a lab engineer in 1946. His work consisted primarily of testing the breaking capacity of circuit breakers and fuses. In 1950, Thoren went on to receive his doctorate while still working full time. In his thesis he attempted to calculate how much one could deviate from the correct value of current and voltages, a theoretical study which was later used by IEC as a basis when writing its specifications for synthetic testing. Thorén progressed through career stages rapidly. By 1954 he became the manager of the high-power laboratory, where he stayed until the middle of the sixties, when he moved to the Power Systems Consulting Department at Västerås. With this move, Thorén found himself in a completely new area of work, developing computer programs to calculate network performance during short circuits. By the late sixties and early seventies he was lecturing internationally as part of a program to introduce ASEA to various parts of the world. Interview #302 for the Center for the History of Electrical Engineering, The Institute of Electrical and Electronics Engineers, Inc.
Bertil Thorén, an oral history conducted in 1996 by Frederik Nebeker, IEEE History Center, Hoboken, NJ, USA. I see that you were born in 1921. In Sweden. Where exactly were you born? That is not to far away from Göteborg. But you have a main railway from the Vänern down to Göteborg. At the other end is the town of Vänersborg. That’s where I was born. Did you go to gymnasium? I went to gymnasium, but in another place, in Skara. It is not too far away, but it is inland from Göteborg. Was it always clear that you were interested in science and technology when you were a boy? That’s true. There was no doubt about that. I see. Did you have a radio yourself, a crystal radio, for example, when you were a boy? I tried. I bought some pieces and tried to get it to work. But it did not. And what did you do when you finished gymnasium? I went to the Technical University in Stockholm and studied Electrical Engineering. At that time there were two lines, is that right? The weak current and the strong current? Mainly, yes. I took the strong current. You were always interested in that type of engineering? Yes. Not so much in electronics. It was a difficult to understand the radio tubes, but the power engineering interested me. Oh, I should have asked about your family background, what your father did. My father started out as a military man. My whole family were farmers rather close to where I was born, Vänersborg. I’ve done a lot of studies on my ancestors, so I know most of it. They were farmers, but my father had seven brothers. They couldn’t all take over the farm, so he had to do something else. My father had no theoretical education, so he went to the Army, and made it the long way up. Oh, from the ranks, so to speak? Yes, yes. When I was born he was what was called an under-officer, which is not officer but below it. I see you earned your Masters Degree in 1944. Did you take employment at that point? I see, you had military service. It was compulsory at that time, so I had to go for one year of military service between ‘44 and ‘45. Yes, I know that was a tense time for Sweden because it was trying to stay out of the War. Oh yes. You know, I had problems at that time with my hearing, and today they wouldn’t allow me in military service, but at that time they took everybody. So I spent a year there, and then I went to ASEA, and started there in March ‘45. They had a course for young engineers which meant that you stayed for two months at each department, and went around. That was a very useful time. Where were you working? Was that in Västerås? In Västerås, yes. Then in early ‘46 I got steady employment at Ludvika, at the High Voltage and Short Circuit Laboratory as a laboratory engineer. That sounds like a very desirable position for a young engineer. For a young engineer, yes. It was not in my intention to go that way, but I liked it, so I stayed. What sort of work exactly? Can you recall what the projects were at that laboratory? Oh, at the Short Circuit Laboratory we were testing circuit breakers, fuses, current transformers, and ordinary transformers. We studied short circuits, the ability to withstand short circuits, and the breaking capacity of circuit breakers and fuses. That was the main job. Was the principle testing laboratory for ASEA at Ludvika there? At Ludvika, yes. It was a rather big laboratory and did mainly development testing. We didn't do much testing for the workshops. Sometimes we did, because we had the facilities, but normally not. So you worked on new products. Were some of them being developed there at Ludvika? New circuit breakers, or new transformers or insulators? Yes. I worked especially with circuit breakers. That was the main job. Who was the leader of the group that you worked for? Mr. Bükman handled the laboratory at that time. How large was that laboratory? Maybe a couple of hundred. Oh, my goodness, so very large. Yes, it’s fairly large. They did a lot of development work. For instance, for the 400 KV system of Sweden, which was the first in the world, the equipment was mainly developed in that laboratory. When was that system implemented? '52. And that was a line from the northern part of Sweden down to about this area. You said you started work there in '45, was it? Oh, that’s right. You had that period when you were in different departments and in '46 you started in that laboratory. Well, part of it in '54, because that laboratory was split in two parts: a high-power laboratory and high-voltage laboratory. I became the manager of the high-power laboratory. That was a very interesting time, because we built a completely new lab at that time. It wasn’t at Ludvika, but at a different place, and that kept me busy for a number of years. Yes, well, that sounds like a very rapid advance from starting there in ‘46 to being head of a laboratory in ‘54. Well, you know, it was just that progress through career stages was rather rapid. Nowadays there are so many engineers. At that time we were just a few engineers, and you had a chance to get on very rapidly. I see that you received your doctor’s degree, the Licentiate, in 1950. Is that right? What was your thesis for that? Well, I did my work in parallel with my ordinary job. So you worked full time throughout? I worked full time, and studied in the evenings. I don’t know if that tells you anything at all. No. The deal is the following: When you test a circuit breaker you put on voltage and current, and normally from the same source, a high-power generator is needed. Now you cannot always do that because of a lack of power. You don’t have that big high-powered generator. So the general idea in circuit testing is to split it up. You put on current from one source and voltage from another source. Then you can use a current source of very low voltage, and a high voltage source with very low current, so that the power of each of these sources is much reduced. That’s the idea. You could, nevertheless, learn the behavior under high voltage, high current. Yes. What I did was mainly a theoretic study of this, because before, in the '30s and '40s, there were wild ideas about what multiplication factor you can get for the circuit voltage. I did a theoretical study of that, and it showed, first of all, that the multiplication factor was one, or should be very, very, very close to it. Well anyhow, you can always do with some deviation from the 100 percent. And what I tried to calculate was how much you could deviate from the correct value of current and voltages. I found that you could do some. You could test circuit breakers with a breaking capacity of say, five times that of the laboratory, roughly speaking. It depends a little upon the design of the circuit breakers and so on. So that was my thesis. This was a mainly theoretical study you said? It’s mainly stuff. I did some practical work, too. I designed a synthetic circuit, but not a very big one. They didn’t give me access to the main short-circuit generator, but I used some smaller ones, and tried to find out if the theory was right. Yes, yes, within the limit I had calculated. Later on, when I had left that area, the IEC started writing its specifications for synthetic testing, and I know enough that they used my thesis as a basis. When did they start looking at synthetic methods? In the middle of the fifties or something like that. Was this one of the first studies of such methods? Yes, at that time it was the first to be as thorough as it was. Did you come across this problem in your work there, so that it was obvious that a solution would be valuable? Well, I came across it, actually, when I started my job at the Short Circuit Laboratory, because the power there was not sufficient for testing. Breakers were being developed at that time, so something had to be done. I looked at the previous literature and synthetic testing seemed a good proposition. So this had some real influence on practice? It had some influence. I was happy to learn that people have checked my calculations and they were okay. Well, that is a compliment, because there are so many theses that no one else reads. But I left that field in the middle of ‘54 when I became manager of the High Power Laboratory. I had to build a new lab and that took all my time. Yes. There were no means of applying it then at that university. It was in '54 that they accepted it for publication. I wrote my papers on a typewriter and handed it in, and they accepted it. That must have been difficult with all these equations to do that with a typewriter. No, not at all. You leave space and do it by hand. I’m just looking at your curriculum vitae here. Well, to go on, I stayed with the high power laboratory until the middle of the sixties. By then the new lab was in operation. I had put a lot of effort to improve testing and measuring methods, so everybody was fine. Then I found that I had nothing more to do there. At the same time there came an opportunity for me to move to Västerås and start a completely new area of work. At that time computers were coming into use, allowing people to calculate what happens in the networks during short circuits, lightening, and so on. That had been done earlier by hand. Now it could be done by computer. There was a big interest in such calculations. So it was decided to start a small department with highly qualified specialists in these areas. I became the manager of that. We did a lot of work on computer programs. This is – I’m reading here – the Power Systems Consulting Department at Västerås. Yes. Now that started in that way, but they still had specialists in different areas, stability, high voltage, and things like that. Some of these were put together in this consulting department. Our work there was to develop computer programs, and then we worked for different departments within ASEA to make computations for them. Do you recall what computers you had there in the beginning and in the mid-sixties? The IBM 360 came out about that time? It doesn’t matter. I don’t know that because the computers were handled by another department. We just had access to them. That started in 1965, and you say that was a new approach to study this using the computer? Yes, it was a new approach, because you’ve got means to calculate things, and of course, it was very simple to start with. But it became more and more sophisticated. Nowadays they calculate very accurately what happens in a network during a short circuit, or when a lightening flash comes across, or things like that. From the viewpoint of the consumer of electricity, such studies are important, I assume, because the network can be run more efficiently? Yes, now you can reduce load or something like that. So that’s very valuable. As soon as these means became available, the customers started to require it. They requested us to do calculations to prove that a certain generator was suitable for a certain place in a network. The most efficient way of doing it depends on the system. Oh, so some of these studies that your group was doing there were for customers of ASEA in other countries? Or was it mainly Sweden? They were done for customers in other countries, too, but through other departments. We did some work directly for a customer, but not very much. It was mainly done for our design departments. The sales department especially who wanted to have that information. Did the computer make any difference in the design process of things like circuit breakers and lightening arresters, and so on? Oh, yes, especially lightening arresters. Circuit breakers, not so much, because it’s very difficult to do any theoretic calculations. People still have no algorithm for a circuit breaker. Many have tried. Even me. I used that as a basis here for calculating the multiplication factor, but it depends very much upon the algorithm. Theoretically, there are still no good formulas, but of course, the computer will calculate the short circuit current at a certain site. It will also calculate the recovery voltage. You know, when you break up a short circuit, the voltage from the network will strike back in a way. Now it's very important for the circuit breaker to know what that voltage will look like in magnitude, state, and things like that. Computers can calculate that, which helps the designers to design the circuit breakers and especially to check alternative designs. So it was very valuable in that way. So for the network as a whole, the computer was valuable. For designing the individual components and arranging them into the network, it was useful. So that started in ‘65? It started in ’65 to a small extent at Västerås, and then I went to Ludvika in ‘67. I had a few people working for me here, and then we moved to Ludvika because that was the place where the high-voltage equipment was made. In 1960 you published a couple of articles about the ASEA high power laboratory at Ludvika. Did this new laboratory that you built attract attention from other countries? Well, it always does. We had a number of visitors coming there, looking at it. Well, I know that Swedish High Voltage engineering has always been pioneering. Well, I must say, I’m not a computer man, so I didn’t do any of the computation myself. I had skilled people who could do that, and I was mainly used for other things within ASEA. You see, at that time ASEA went abroad much more than they had done before. I’m now talking about the end of the sixties, early seventies. We found that people didn’t know ASEA as well as we did in Västerås, so the company put on a program to introduce ASEA in different parts of the world. I took part in that, giving lectures in most countries in the world. This was in the late sixties you said? Starting in the late sixties, and then the seventies was the main time when I did lecturing. I see. So this would be lecturing at technical institutes or power utilities? It was very different. We planned symposia where we invited customers. Some lectures were given at the site of the customers, and also at different places. That brought me around the world. I had the chance to get around to different technical societies, which invited me to give lectures. It was a quite interesting time. Can you tell me a little bit about ASEA from your point of view. You mentioned something I didn’t know, that they started selling abroad much more in the late sixties and seventies. How was ASEA as an employer? Were you always happy with the company? For most of the time, except for the salary. Otherwise I liked to work with ASEA. You got good opportunities to do different things, and you could change your job if you wanted, so you weren’t stuck there to just design transformers for all your life. So a person could request to move to another job? Oh, yes. You could request and very often you could go to a new area. Did they have programs for further education of the engineers within the company? Not very much at that time, to start with. They had that course for young engineers. It was a one-year course. After that there were no regular courses, but now and then someone arranged for a course. Usually within a department they were giving lectures about the equipment they were manufacturing. Later on it became more common to have courses. I had a course for insulation coordination: how to run the network based on information about different surges and the impact on the equipment and so on. Today I know there are numerous courses that are arranged in a much better way, but when I started at ASEA it was left to private people to arrange something that might be useful. Was there generally good morale among the employees of ASEA? Did people tend to stay with the company their whole career? Many people did. Some people went to the Swedish State Power Board, for instance. They were often recruiting engineers from ASEA. And some, of course, went to other companies, but generally speaking, quite many of them stayed. How much of the work that you were involved with was related to this moving to higher voltages? Most of it later on. I’m sure all components have to be redesigned. Yes. Sweden started high-voltage with a 400 k-volt system, you know, inaugurated in ‘52. Then, in the sixties or the seventies, we found that we would have use for 800 KV, which had been started by the Canadians out of Quebec with the first lines in the area of 735 KV. So we had a joint talk with the Swedish state power board designing lines and equipment for 800 KV for Swedish systems. Was this in the late fifties, roughly? No, in the late sixties and early seventies. That came to the sore end. Can you tell me a little about that? Yes, that’s historically interesting, because the idea was that the first line should go from a nuclear power station north of Stockholm, down to the Stockholm area, about this area here. And actually, the line was designed and built, but it was never operated at 800 KV for political reasons. We had a Prime Minister at that time who belonged to the Farmers Party, and he didn’t know anything about technical things. Somebody had got it into his head that this 800 KV line going from the nuclear power station would carry nuclear energy. It was so ridiculous, but that’s the way it was. At the time, the Prime Minister was absolutely against nuclear power. None of the nuclear power stations were built were built during his time. He said no go to this 800 KV. So the State Power Board had to rebuild the line to a double circuit 400 KV, and that is how it is today. Of course, that works just fine, but it’s more costly. Was it pretty much his own decision, or did this become a larger political issue? It became a political issue. You’re telling me the main opposition came from people who thought that somehow nuclear energy would come through this line? Yes, they thought it would be dangerous because of the nuclear power. That’s how the rumors went. So we had to abandon that. There were no other 800 KV lines built in Sweden? No. That was the end of it. So 400 KV is the highest? It’s the highest, yes. And it operates fine. Many of those lines were built. Not only the nuclear power, but also the influence on the general public of the electric field was a big issue at that time. Yes, that’s been a big issue in the United States. It still is in many places. And the funny thing is that the fields around the 400 KV line are higher than the fields around a 800 KV line, because the 800 KV is higher up. It’s a longer distance from the ground to the line. It must have been a big disappointment to the engineers who designed that 800 KV line. Of course. There is a description of that whole 800 KV system somewhere here. Maybe you can point it out to me. I see. Gunnar Janke [spelling?] was the name. Yes, I’d hoped to talk to him. That’s a description of how it should have been. Can you tell me what part you played in designing that 800 KV system? Well, in the computer department we did a lot of studies of all the voltages of the line. My part was not a very big one, because it was handled by designers. So fairly early in your career you became a director, a laboratory director? Did you like doing that, directing the work of many people? Sure. Yes, I really liked it. It was a hard time, because there were no eight-hour working days then, but I liked it. I have a pamphlet on that if you’re interested. It’s a little bit off. Yes, yes I am. I see, this is a booklet called The ASEA High Power Laboratory. Is this something you wrote? Yes, but I don’t think my name is on it. It’s not mentioned. Is this an extra copy? Yes it is. You may keep that. As a matter of interest they are rebuilding that laboratory now. Maybe we can continue to review your career here. I would like to mention our cooperation with American Electric Power. Yes, why don’t we do that now. You probably know about the AEP system. It’s mainly in Illinois I think around there. That doesn’t matter. They have 345 KV, and they found that they would need a higher voltage. And then they were shooting for the highest. One of the engineers told me, "Once we get permission to build a new line in a certain area we’ll never get any more permissions, so it needs to be as high a voltage as possible." There are two main reasons for high voltage. One is that you have very long distance transmission, which is the case for Quebec in Canada for instance. It was also the case in Sweden for transmission from the north to the south. There’s a different problem for AEP because they had a rather concentrated system. The other possible reason for using very high voltage is if you have a concentrated system and you need to push large amounts of power from different parts of it. They also had a special problem. They were considering a site for new power stations, which people always opposed. One idea at that time was to put together a number of power stations in a certain area. That way they destroy only the small area around them. It was called the power park. That was one thing that people were thinking about at that time. So they thought they would need higher voltages, and they went around to different manufacturing companies to find out whether they could get some cooperation on help. And they selected ASEA. General Electric was very, very angry about that. They sent a message to the AEP top management trying to talk them into using GE instead. But no way. Had General Electric done any very high-voltage work? No, not really. They had 345 KV. They had built that line. And 500 KV at the West Coast, but that’s all. Well, they selected ASEA as a partner. AEP would build the lines, and ASEA would design and develop suitable equipment. We did that. We developed a transformer for, if I remember correctly now, 1600 KV 3-phase, which is over the square root of three to get everything in phase because it was enough costly to build a single-phase transformer, and the line was single-phase, too. We started out and did systems studies for them, and thereafter they really started developing the line. We built a test station near South Bend, and I went over quite often to that station. What we did in that station was mainly investigation of the corona: corona disturbances, corona losses, etc. They tested different bundle configurations and things like that to see what the optimum design would be. There are a number of reports written about that project. You can find them; they are ASEA reports. They will be easy for you to find. Okay. I was just noticing here that you’ve listed that you were director of the AEP-ASEA UHV research project from 1969 to 1984. Is that right? Yes, that’s from the ASEA point. I managed it from here. I didn’t do the job. That was spread out in different departments, but I had to put it together. From the AEP side they had first Howard Barnes. He retired and went to Arizona – and had a lazy time. He was followed by Hal Shearer. You might have heard his name. He was president of the Power Engineering Society for some years. He is retired now, but he’s still alive. If I’m correctly informed, he's managing the American participation in CIGRE. He was my counterpart at that time. There are a number of CIGRE reports listed here. Yes, there are a great many. Then there is a final report, which I have no copies of. It is proprietary; I think it was for AEP, but if you like you can write down the title. I’ll just take a look at it. I suggest you get it from AEP. Let me just put it on tape. This is the AEP-ASEA UHV research project report number UHV88-2, July 1988. This is the assessment of final results. Can I get from you your assessment, looking back on this long period of development, of how the work went, and how important it was? Well, technically the work was very easy. We had no problems with cooperation with AEP. We helped each other, and there were no real problems. The outcome of the whole thing was something of a disaster. And the reason for that was the oil crisis in your country, which slowed down industrial work. At the end of the seventies AEP found that they didn’t have any use for the high voltage. The manufacturing companies in their area were mostly steel mills and iron foundries and so on. That area went down. In your country people were developing electronics instead. That activity was centered in the southern part of the United States. So finally, after the work had been done, we found there were no markets for it. Were there efforts made to find other locations for this ultra-high voltage? No, not really, because the whole industry of electricity production changed. Now small is beautiful, and instead of building power blocks and transmitting quite a lot of power over long distances, people are building small power stations here and there and everywhere, and the demand for electricity is not so high as it used to be. Certainly the growth rate is slower. So if we look at the history of power engineering, and especially power transmission, you have, at the very end of the nineteenth century, the development of these AC systems for transmitting power from Niagara Falls to Buffalo. Was there a steady increase in the voltage of this long distance transmission for the next half century or so? Right, was there a gradual increase in the highest voltage used for transmission? Not gradual, more step-wise. As I said, AEP had 345. Bonneville, in the West, had 500 KV, and that’s the end of the United States. The Canadians had 335. The highest voltage today used is in Russia. They built 1100 KV lines for transmitting power from Siberia to the European part of the country. Then came a new competitor in that field, high-voltage DC. ASEA built the first high-voltage DC system in ‘54, and that was a cable connection between Sweden and the Island of Gotland. That was the first. Then at the end of the fifties more high-voltage DC lines came into operation. ASEA built one on the West Coast in the United States. Yes, I know of that line. After that, the mercury arc wires were superseded by thyristors, solid-state devices, which are much more reliable, with much less outage and so on. Now high-voltage DC has been very common in many parts of the world. What sort of voltages are they getting to? Do you know? Well, I should know, but I would guess 500 KV – 400 or 500 KV. Did you have any involvement yourself in high-voltage DC? Not very much. That was handled by another department within ASEA. Was there much transfer of technology from this ultra-high voltage AC to the high voltage DC? Were any of the components transferable? No, no, not with DC, because that’s entirely different. It’s just a different thing. So all the components are different? Yes. But from the ultra high-voltage development work came a lot of knowledge for AEP, especially for lower voltage, for 745 KV and things like that. They learned a lot about corona influence and things like that. They were actually running this ultra-high-voltage test line after we ended the project just because they wanted to test at other, lower voltages. So some use came out of it. Is that also true of the Swedish development of that 800 KV line? Was there some gain from that development? Was there some gain for the 400 KV lines that came out of the work on the 800? Well, maybe not so much for the line, but we learned a lot about the development of equipment for high voltage and the technique of the insulation of transformers. It was not completely useless. Development is continuous in the area of developing equipment, and you always learn a little from new equipment. How good has the international exchange of knowledge been? You’ve mentioned some contacts that ASEA had with AEP and elsewhere. Is this a field where there is very quick transfer of technique from country to country? Rather. Mainly because this project with AEP meant having intensive exchange of engineers. I mean, many of ASEA people went over there to talk with AEP, and the AEP people came over here to talk with us. So it was completely open contact. You have quite a list of publications here. I’ve often been surprised that companies are often so open about sharing the results of their research. This research and development is very costly, but then results are published. Well, to a certain limit. When writing a report, you don’t have to tell everything. So there are always things that are kept secret as long as possible. In the long run it is difficult, because other people are doing the same things. But it’s not that manufacturing companies give away what they have. They know what they should keep to themselves? Yes. Many things you can talk about quite openly, because many people know about it, so writing reports is often a way of telling your customers that you know this. But you don’t want to tell your competitors. It’s a certain balance. Yes, you want to advertise that you’re able to do this, and show that you really know what you’re talking about, but not reveal everything. Yes. And that was one of the main reasons why we arranged symposia, for instance. We were telling our customers that we know this. We didn’t tell them exactly how we did it, but we told them that we did it, and we showed them the results. I’m looking here at your professional affiliations. Since I’m employed by the IEEE, I’m interested in your connection with IEEE. What seemed valuable about IEEE to you in your career? Was it mainly the publications that you received, or was it conferences? No, it was not, especially during the time we worked on the AEP. I was over in the United States quite often, and I would time that so that I could attend the IEEE conference or the Power Engineering Society Conference. I did that quite often. That was certainly valuable. You got to know a number of people. You could discuss things with them. And yes, it was generally valuable. You have quite a list of other commissions and professional groups that you’ve been with. Maybe I could ask you about the International Electro-Technical Commission? The IEC, yes. That’s the board that writes the standards. I was working there for quite a number of years on different committees and working groups. I see you’ve listed here, “Swedish delegate in the Committee for Insulation Coordination” for twelve years or so. Yes, that was my main job. I was also on the Committee for Standard Voltage or something like that. It was a very interesting time, because the IEC was writing standards, and there was rather a clash between different countries. Many already had their standards, and they were trying to combine those to IEC standard, and that’s [Thoren makes a growling noise]. Right. I know IEEE puts a great deal of effort into its set of standards. Does the IEC usually succeed in resolving these clashes? Is it the case that there are...? Well, at the end usually something comes out. The worst thing I was involved in was standard voltages. At the lower end, you know, in Europe you use 220, and 240 in the British Empire part of Europe. They also had that in India and other places. In Continental Europe it was 220, and you know, it’s not easy to combine. The English people claim that they couldn’t use 220, because then they would loose some of the transmission power, which they certainly would. People using 220 said they couldn’t use 240 because the insulation levels were not sufficient. It went on like this for many, many years. The outcome was a compromise on 230. And then to make it easy for people to adopt that, they changed the boundaries. Yes, yes. Then it came out that way, so 230 is now the actual standard for all of Europe, and different countries are trying to comply with that. In Sweden for instance, we are adopting 230. It was not too difficult, because we had 220, and the only problem was at the higher end we didn’t have the insulation levels for 220 plus 15% over what the claim was, so we decided to reduce the upper limit a little. But that was the only way to do something about it. We had another problem at the higher end. The Canadians had 735. You may question these values. Why not 200 instead of 220? Well, it’s very simple. The people decided to use 200 volts, which is a good figure, and then it was considered that you needed 10% higher volts after sending, and then you came to 220. And it’s the same at 400 KV, for instance. We actually decided about 380 KV in Sweden because it is the square root of three times 220. But then the 220 was changed to 400 KV. Yes, the 400 KV system was named 400 KV. It was actually higher--something like 420. 400 KV should then have an upper limit of 440, but it was considered that at these voltages you don’t need a 10% difference between sending, so 420 was decided upon. The Canadians had decided upon 700, and then it would go 5% more, then so it came at 735. Then AEP did something different. We decided upon 750. And then to make it even worse, they considered that to be the lower level, and 785 to be the higher level. Now that didn’t do very much, because there are not many connections with the 800 KV system, but that’s the lower end. I mean, when combining or connecting all these countries, it’s useful to have the same voltage. Yes, yes, and I know that’s happening more and more, of course, over time. Yes. Something of the same happened with the frequency. In your country, you run 60 Hertz. In Europe, we run 50, and the reason for that I don’t really know, but there was no talk about connection between the two, so we could choose what we wanted. Sixty is a good figure because you can divide by quite a number of different figures. Fifty can only be divided by two or five. In Sweden we had it at twenty-five to start with, and in many other countries we had a variety of frequencies. Yes, I know in England for a long time they had different frequencies. The electric trains transmitting iron ore from the Swedish mountains to the Norwegian coast run at fifteen. Now all that is no problem, because people are using solid state converters between these different frequencies. That’s easy. You don’t have to rebuild the network. Didn’t they have the rotary converters before? They had rotary converters before. But then we were stuck with one-third or two-thirds of the frequency. Well, that is very interesting. I’m noticing here that you had some connection with the Indian Institute of Science in Banglore. Yes, but not very much. I’ve been to India a couple of times. The first time I went around for four weeks. I got to know some of the Indian professors. We also had some Indian professors over here who were working for us for some time. Then they asked me to do that job for them. I see. I wanted to ask you also about other Swedish power engineers that you have worked with or come in contact with. Are there any that impressed you greatly or that you care to comment on. We mentioned earlier Gunnar Jancke. Did you work with him? We worked close together. We were very good friends. What can you tell me about him as an engineer? He was an excellent engineer, not so much in theoretical work, but in practical work. He was the one who got Sweden into 400 KV, for instance. He was a leader in that? That was mainly his job. Of course, other people helped him. I did a little in some ways, but it was actually his job. And also that story with 800 KV. That was his baby. I see. So he was the prime mover in those two projects? Yes, he was. He was chief engineer there, not so very much in management and things like that, but he was the technical leader. I think he had a brilliant idea of what the future would be like. So he was one of these engineers with a vision, who saw that certain things might be achieved and pushed for it? What other engineers do you think of as very impressive? At the Swedish State Power Board, Siguard Smedsfell was working for Jancke for some time. Then he got his own department and he was one of the people working on developing Swedish systems – not the running of them, but the development of them. He was also a very good engineer. I left there more than ten years ago, so many of the names have fallen out of my head. But they had a number of very good engineers at the Power Board. Is there anything that I haven’t asked about that you’d like to comment on? I think I commented on quite a bit: my own job starting with circuit breaker testing, building the laboratory, and then going on to computer work. The application of computers. And then we talked about development in Sweden of the 400 KV and 800 KV. We had the American Ultra-High Voltage and the Canadian 335 KV. I was not really much involved in that, but I was there when they put the first line into operation. '55, something like that. I was there waiting for things to happen. For the sparks to fly? We had to wait, and wait, and wait, and wait, and wait. Then in the evening they offered us cognac. Then they finally pushed the button, and the line went into operation, bang, everything went out. They had forgotten the earth connections in one of the towers. But then in the middle of the night it started and it worked all right. Okay. So they’d invited quite a number of engineers to see this? Putting the line into use? Oh, yes. They’d invited quite a crowd. [laughter] We were waiting for something to eat. I think we got some sandwiches. They probably had expected to start the line much earlier, but I remember problems coming up. But it worked, and we were happy, because we had delivered the transformers. They were our transformers. And some of the equipment was ours, too, and that’s the reason for my being there, just to look at it. I remember the chief engineer, when the thing started, looked at me and said, “The transformers must work!” [laughter] Anyhow, they extended that network later on, and I think they have had good use from it, because it’s a long, long distance from the lake area in Canada down to the Montreal area. This page was last edited on 20 December 2018, at 18:56.